Halifax, NS – 8 February 2016 – DHX Media (“DHX” or the “Company”) (NASDAQ: DHXM; TSX: DHX.A, DHX.B), a global leader in kids and family entertainment content, has licensed its new original performing arts drama, Backstage (30 x 30’), to Disney Channel in the US, UK, France, Spain, Italy, Portugal, Nordics, Benelux, Germany, CEE, Turkey, Middle East, Africa, Australia and New Zealand. Backstage was created and developed by Fresh TV in association with DHX Television. The series was filmed in Toronto and is slated to air on Family Channel in Canada in spring 2016, and Disney Channel in the UK and US in spring 2016, with international roll out in 2016. Backstage, a scripted series (shot docudrama-style), follows a group of outstandingly talented teenagers as they live through the highs and lows that come with attending the prestigious Keaton School of the Arts – from new friendships and crowning achievements to the angst and disappointments of the high stakes competition. Through diary-style confessionals and dramatic cliffhangers, Backstage lifts the curtain on these rising stars as they chase their dreams and deal with the day-to-day reality of being a student, a sister, a son, a girlfriend — a teen. Fresh TV is a world leader in creating and producing family entertainment. This award-winning multi-media company set new audience delivery records when the Total Drama Island finale was the #1 telecast in Cartoon Network’s history and the series itself served as the anchor to Cartoon Network’s prime time comedy franchise HAR HAR THARSDAYS. Fresh TV’s live-action series My Babysitter’s a Vampire, based on the successful movie of the week, ranked as the No. 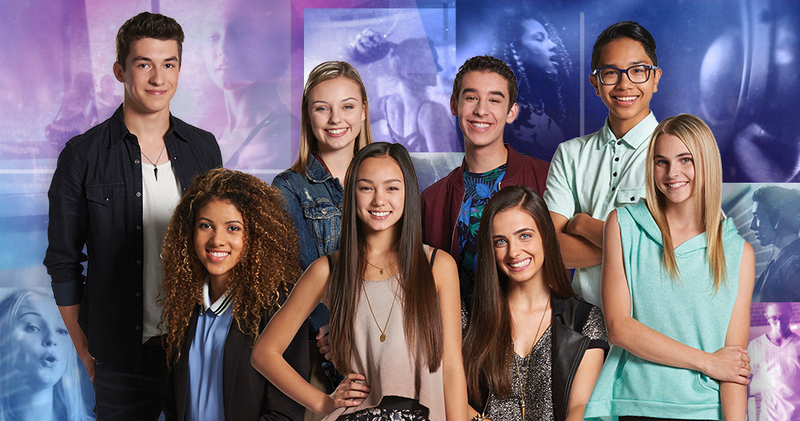 1 U.S. cable show amongst kids 2-11 in its time period during its premiere season run on Disney Channel and met with record high ratings in season two. Founded by Emmy-winning producers Tom McGillis, Jennifer Pertsch, George Elliott and Brian Irving, Fresh TV finances, develops and produces animated and live-action television that powerfully connects to the interests, influences and enthusiasm of tween and teen audiences around the world. Fresh TV eats, sleeps and breathes to create television young people will love to watch right now. Fresh productions include the Total Drama franchise, 6TEEN, Stoked, Grojband and the live-action series, My Babysitter’s A Vampire, Really Me and the Disney XD movie Bunks. Fresh TV offers the services of world-renowned animation studio Elliott Animation which provides a full range of 2D, 3D-CGI and 2D Flash animation production services for major North American clients from its studios in Toronto and Hamilton, Canada. For more information, visit freshtvinc.com. This press release contains forward looking statements with respect to DHX Media including the timing of a television debut and the success of the series internationally. Although the Company believes that the expectations reflected in such forward looking statements are reasonable, such statements involve risks and uncertainties and are based on information currently available to the Company. Actual results may differ materially from those expressed or implied by such forward-looking statements. Factors that could cause actual results or events to differ materially from current expectations, among other things, include risk factors discussed in materials filed with applicable securities regulatory authorities from time to time including matters discussed under “Risk Factors” in the Company’s most recent Annual Information Form and annual Management Discussion and Analysis, which form part of the Company’s registration statement on Form 40-F filed with the United States Securities and Exchange Commission. These forward-looking statements are made as of the date hereof, and the Company assumes no obligation to update or revise them to reflect new events or circumstances, except as required by law.